Fleetwood Hicks was so convinced that there was a huge market for his customized bikes that he put everything he had into it and never took a pay check as the business continued to expand. In just two years from opening up his first store in Dallas Texas, Hicks was Featured in Entrepreneur Magazine as one of the 100 Most Brilliant Business Ideas for 2010. Bike sales continued to climb and they were selling around 350 custom bicycles a year. About one custom bike a day on average with a sticker price of around $650 each. Each bike cost's approx. $250 to produce so the profit margin for such a customizable product was enough to spark some interest in the Sharks. 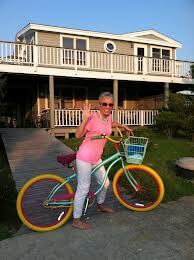 Specifically Barbara Corcoran, that claimed She was their sweet spot as their target market. Corcoran says she buys (bought) an average of 4 bikes a year with at least a $500 price tag and they are not nearly as nice as a Villy Customs Bike. Whatever jitters Fleetwood had going into the Shark Tank must of went flying right out the window after having one of the Sharks give a recommendations like that. In fact almost all of the Sharks complimented Fleetwood and his dog DeVille in one form or another. Yes, even Kevin O'Leary managed to get out a compliment in his own way. He may of not invested in the company but he offered to buy the Villy Customs bike they made for the Shark Tank Show for $5,000.00. Only problem was they could not sell it with the Shark Tank logo on it. True Story. Villy Customs Bike She Designed. In the end Mark Cuban and Barbara Corcoran made a deal for Villy Customs for a half a million dollars and 42% stake in the company. The two Sharks that Hicks hoped and prayed to go in business with, is now a reality. What makes Villy Customs such an interesting success story is the fact that Fleetwood has been keeping an ongoing post on the Villy Customs Website starting from the very beginning on dealing with the Shark Tank Show. If you ever plan on going on the show or want to know what it's really like for the contestants, this is a Very Good Read. Fleetwood writes it as if you are there with him going through the emotions and really, the run around that they put you through every step of the way. You never really know if you will ever make it on the Shark Tank Show until you get a call several months after the actual filming. It's a long (and ongoing) article that gives you little known details of the entire process. Fleetwood, if you ever read this, I Love the article, but have you ever tried to read it yourself on the peach colored paper? Maybe it's just me, but it's not exactly easy. I ended up highlighting the article so I could read it better. Just a thought. I look forward to the next update where you go into more detail detailing out what it's like having Mark Cuban and Barbara Corcoran as business partners. This is a super cool idea taking something that has always been massed produced and customizing it for the consumer from the ground up. What other current invention can be personalised and made into it's own unique brand? The correct answer to that could very well land you on the Shark Tank Show . Custom Design your own Bike Here At Villy Customs It's actually kind of fun using the 12 different features to see what you can come up with. p.s.- My Son just seen this and his first question was "Can I design my own mountain bike"? An entire brand new market that has yet to be explored. Hi there, I really enjoyed reading your blog post. Thank you for taking the time to right so positively about Villy Custom. Very cool. We changed that background for ya a while back :). 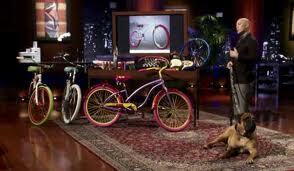 Watching this on Shark Tank now! I love it! Very great success story. Their website is down right now because of all the traffic from the show.